LOS ANGELES - MARCH 29: Lakers commentator Chick Hearn waves to the crowd during the game between the Portland Trail Blazers and the Los Angeles Lakers at Staples Center. LOS ANGELES, CA - JUNE 1985: Legendary broadcaster Chick Hearn of the Los Angeles Lakers addresses the crowd during the 1985 Championship Parade. 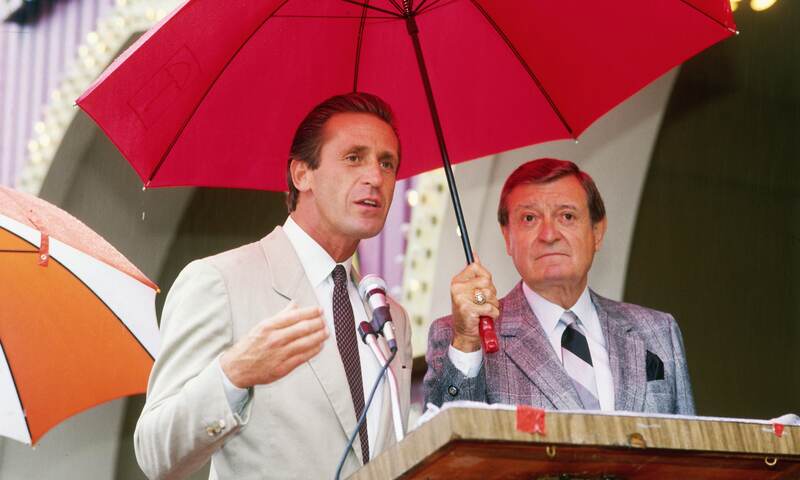 LOS ANGELES, CA - 1987: Pat Riley of the Los Angeles Lakers and Chick Hearn speak during a Hollywood Star Induction circa 1987. 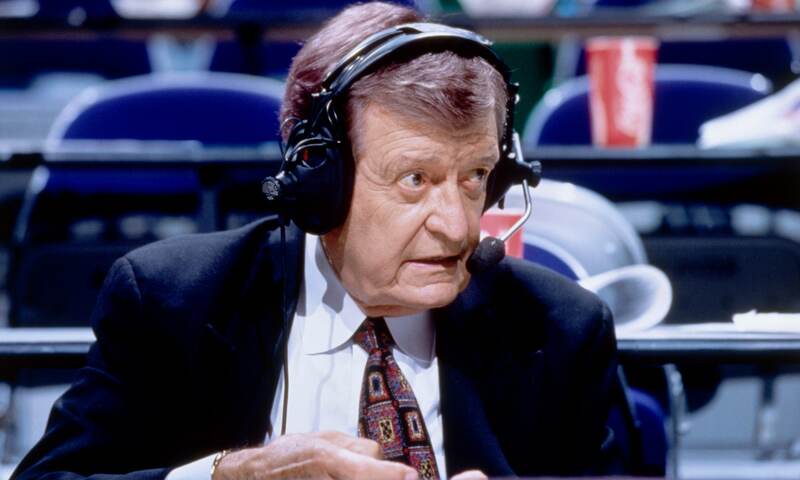 INGLEWOOD, CA - 1996: Los Angeles Lakers broadcaster Chick Hearn calls a game circa 1996 at the Great Western Forum. LOS ANGELES - MARCH 29, 2002: Los Angeles Lakers commentator Chick Hearn meets with Shaquille O'Neal #34 of the Lakers before the game against the Portland Trail Blazers at Staples Center. 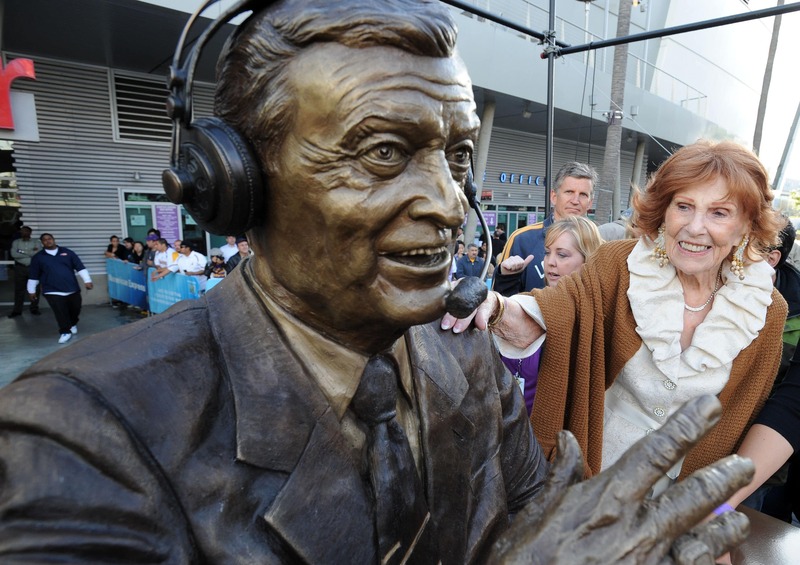 LOS ANGELES, CA - JUNE 3, 2010: A statue of legendary Lakers' broadcaster Chick Hearn is shown outside of the Staples Center before the game between the Boston Celtics and the Los Angeles Lakers in Game One of the 2010 NBA Finals. 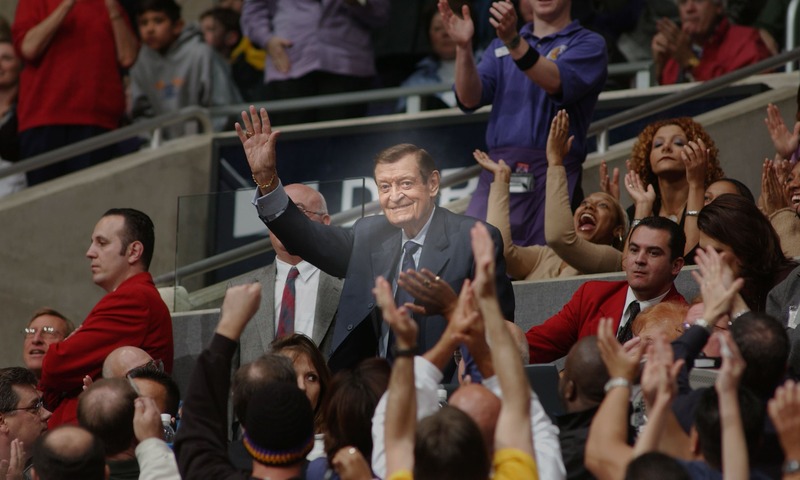 In August of 2002, the Los Angeles Lakers lost a cherished family member with the passing of Chick Hearn. 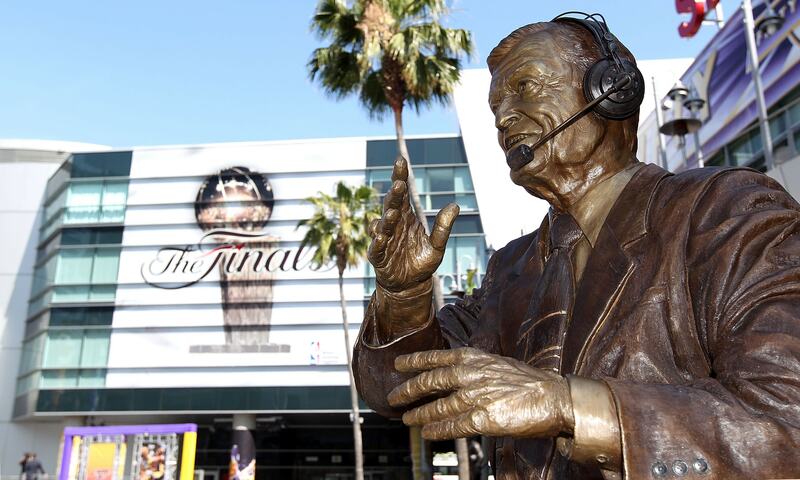 More than an announcer, Chick embodied the spirit and determination that have made the Los Angeles Lakers champions nine times over. 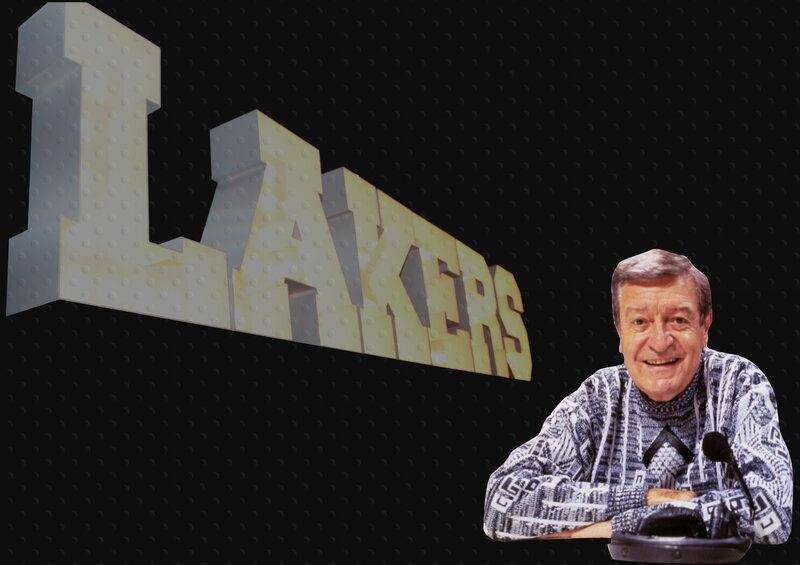 The Lakers lone play-by-play voice since the team moved to Los Angeles prior to the 1960-61 season, Chick was the Lakers for the better part of four decades. With his words-eye-view of the game and colorful chickisms making his broadcasts truly one of a kind, it is a streak of unmatched proportions that will perhaps be Chick's lasting legacy. 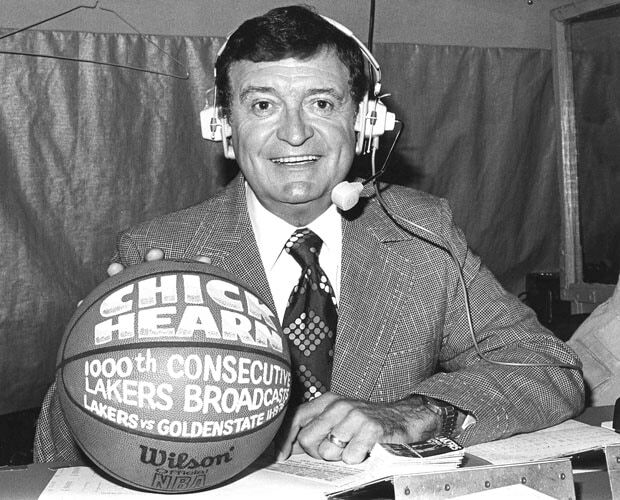 Beginning in Las Vegas on November 20, 1965 with a 133-117 victory over the San Francisco Warriors, Chick went on to broadcast 3,338 consecutive regular and postseason games, with the streak culminating in a 101-85 victory over the same Warriors on December 16, 2001. Two days later Chick underwent surgery to replace the aortic valve in his heart. The surgery was a success and Chick was expected to make a full recovery. Anticipating a return to the broadcast booth on March 1, Chick was again befallen by bad luck as he suffered a hip fracture in a fall on February 17. This additional setback would force Chick to undergo a second surgery and more rehabilitation. Again, however, he persevered and on April 9th, returned to the booth to broadcast the Lakers 112-82 victory over the Utah Jazz. Shortly into the broadcast of a game that began with the sellout crowd of 18,997 giving Chick an extended standing ovation, the legendary announcer gratefully exclaimed, "this is the happiest I've been since I married Marge!" 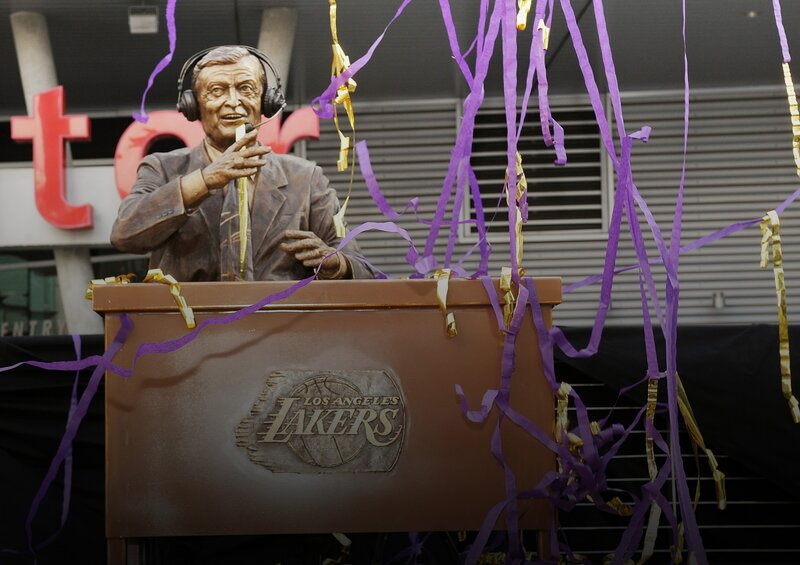 Chick, along with his announcing partner of 15 years, Stu Lantz, broadcast the Lakers final five regular season games and each of the Lakers 19 playoff games. 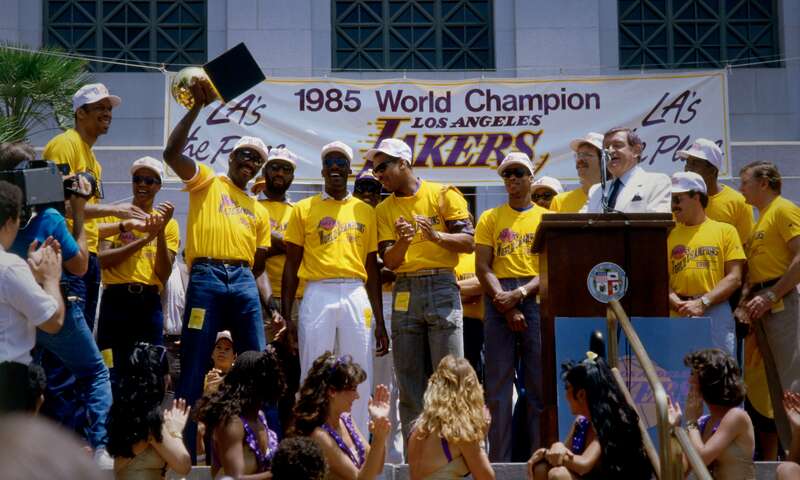 With Chick returning to his familiar position behind the mic, the Lakers season culminated on June 12 in New Jersey with their third consecutive NBA championship. 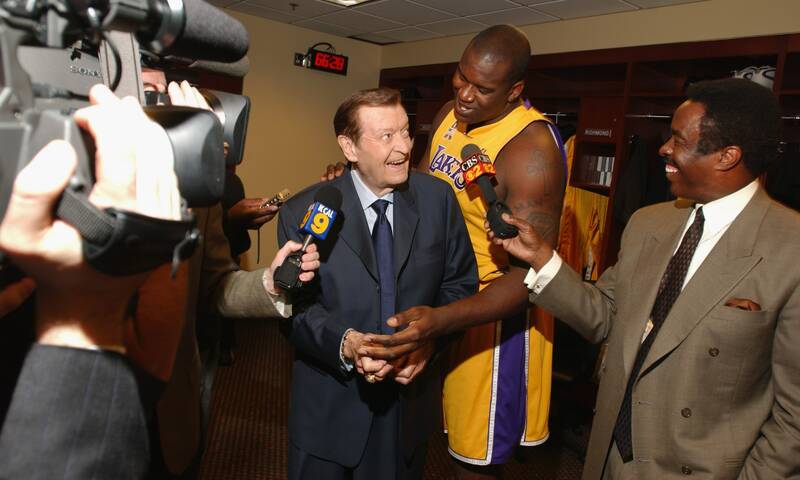 The refrigerator door might have closed for the final time on that June evening as the Lakers defeated the New Jersey Nets, but Chick will forever be remembered for the fervor and passion that he brought to each and every Lakers broadcast.